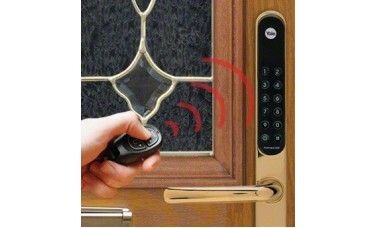 Yale have really set a new standard for electronic keypad entry on uPVC doors with their KeyFree device. Not only do you have a digital combination keypad to open your door, but you also can operate the lock from a remote fob just like on your car! What's more, the system carries the Police-Approved 'Secured By Design' label, giving you utmost confidence in the security of the system, without having the nuisance of keys to operate your lock. With our kit, you don't just get the handles, you get the kitemarked Yale Euro Cylinder for key-override, which is contained neatly within the lower panel of the external handle, as well as the unique Yale KeyFree spindle, and the correct fixing bolts - all taylored to suit your door by simply choosing your door setup from the list below! The Yale KeyFree system allows for up to 4 programmed remote control fobs, a combination code on the digital keypad (as well as an additional temporary code setting for allowing workers temporary access while you're not there without handing over your main code), and a key-override facility should you lose your fob and forget your code! With our complete Yale KeyFree kit, you get everything you need for your specific door size, not just the keypad handle set. 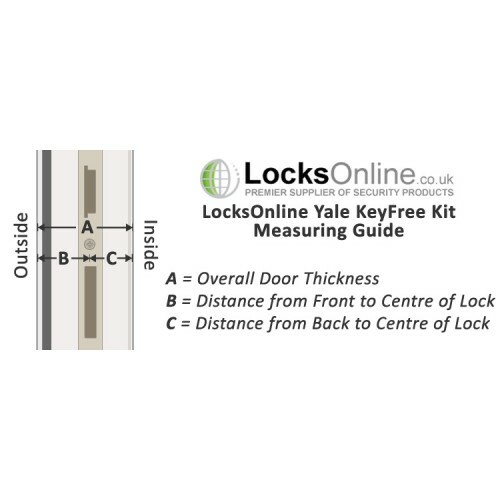 This includes the kitemarked yale override cylinder, the unique yale spindle required on these systems, and the fixing kit for securing the unit to the door - all specific to the door measurements you select; a service we are proud to say we cannot find anywhere else! We include all of the following in our Yale Keyfree Kit! Darrel: Hi, guys. My name is Darrel, and I'm head of the Tech Team here at LocksOnline. Thanks for taking some time to tune in and watch one of our product review videos. Now, we put these short little videos together to be able to give you, our customers, the opportunity to see the products that we have to offer, and hopefully a little bit more detailed. In the flesh, so to speak. So today I want to show you an exciting product that we have on our website. 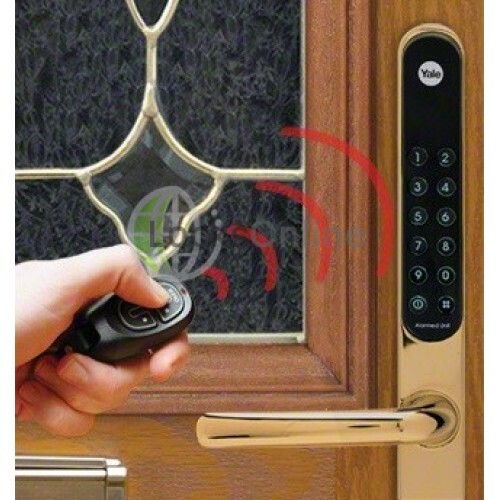 It actually solves an incredibly large amount of problems in regards to the access industry, the access control industry, in regards to multipoint deadlocks on UPCV doors and composite doors. What this particular product is, it's the Yale KeyFree Combination Digital Electronic Combination Lock that's not available for multipoint locking solutions. Now, I have it here in a bit of a template to sort of set it, because I want to try and explain to you how it all works, and go through it all in its individual little bits and detail. We've got some bullet points as well up here on the board. The idea is, is that I'm gonna try to explain to you as well... There's a little bit of a measurement that you need to consider doing if you're thinking, "you know what, this is absolutely ideal." So I'm gonna have a chat with you a little bit later on in respects to that as well. So, some of the key features. How does this actual combination lock work? Of course, a lot of combination locks on the market these days, you have to do one critical thing to get it to work, and that's to be able to lift the handle up to actually throw on the bolts, and then you would physically then turn the key. What Yale have done here is they have managed to do that, either through use of a fob, or actually through the use of a key code from the outside. From the inside, you would be able to lift it up and lock it like normal from the inside as well. So absolutely brilliant news in respects to that. 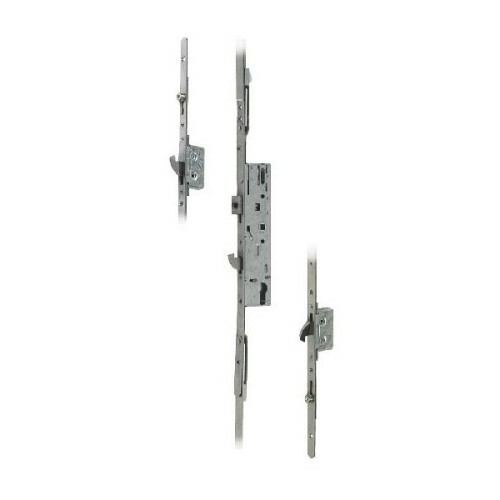 So it has actually been designed to work with the Yale Doormaster multipoint locking solutions, but I'm going to show it in a little bit more detail after, that it may actually work with other manufacturer's multipoint locks as well. 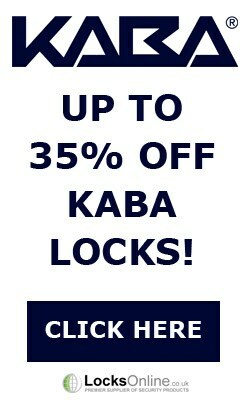 Of course, Yale will only approve it to work with their multipoint locks, which is pretty obvious, really. 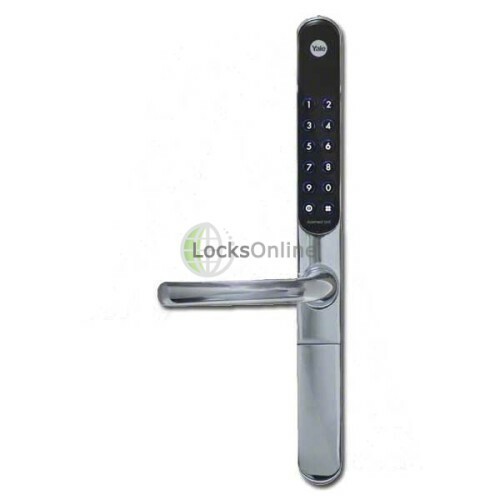 One of the distinct advantages as well, if you do decide to change the locking solution in the door as well, then you'll only get secured by design, which is one of the police approved bodies, etcetera, to ensure that the security and the integrity is absolutely paramount in regards to locking solutions on doors. So that's well worth considering that. But, as I mentioned, there's probably very little reasons why it cannot be used on other types of applications. So let's get onto the exciting things in regards to this. Let's actually get it lifted up here, and we'll try to talk you through all of the different types of things. So, as I've mentioned, I've put a lock case in the center here to try and show you how it all actually gets fixed together. 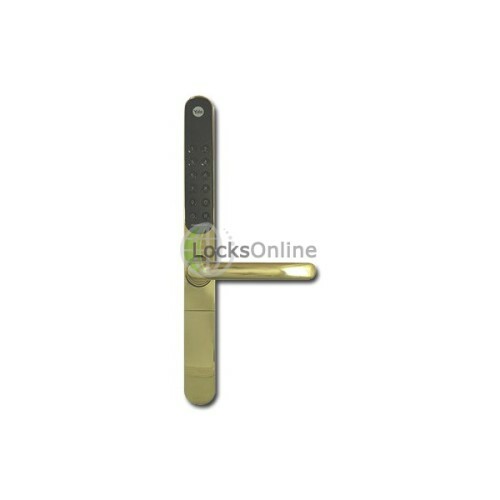 Of course, that's the type of multipoint lock that you may find in a UPVC or a composite door. So there's the back. I'm gonna put fingerprints all over it now. I've tried to keep it as clean as possible, but there's the back. This is the battery compartment in here, where all of the batteries are kept. There's a little knob here, which, I'll show you how that works in a second. Daryl: ...I can now drop that down there like that. Locking System: Disengaged. Please reenter your credential, and lift the handle to securely lock. Daryl: There you go. So it's wanting to talk to me to say what it needs to do. But now I've effectively got into my property, and now I'm in. So it really is as simple as that in regards to using the key code. We do supply our KeyFree with two fobs of standard. On the fob itself, you can actually just press the button and do exactly the same as what we've just done there. Daryl: ...I would now lock the door. Locking System: Lock closed. Securely locked. Daryl: I now lock the door, and obviously everything now is all in the locked position. As I'm coming up to the door, around about five meters away, press the button. Daryl: Press the handle down. Locking System: Disengaged. Please reenter your credential and lift the handle to securely lock. Daryl: So there you go. We're now actually back into the property. So on the backend, if you're on the inside of the house now, there's the handle there, which, if you just wanted to operate the actual latch itself, you push this in there like that, and that allows you to operate the latch there. All right? So that has now allowed you to actually open the door there. Sorry, that's a pull there. Sorry. So that now has allowed you to just open the door. I'm pressing buttons there – two secs - let me get that. Daryl: ...And now I've actually locked the whole mechanism, in which case, the only way you can open it is either by pushing the turn in, dropping the handle from the inside, or entering the code, or using the remote fob. Daryl: ...I now get out, and I can then secure it then on the outside once I'm actually out of the property. All right? Daryl: So I'm hoping it's been able to explain to you, just generally, how it all works. There are loads of other different features that are available as well. It's not my intention to go through more, and we do have more bullet listed. But what the video allows us to do is to actually try and show you, in the flesh, so to speak, how it all gets puts together. 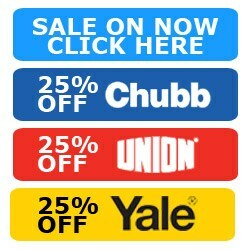 Also, Yale have put a degree of redundancies into this particular key free system as well. So, for an example, on the front here we have this plate. But in the event, for whatever reason, the batteries were to fail, it'll actually tell you when the batteries are starting to fail, and suggest that you want to change them. But let's assume that we don't. You can actually drop that down there like that, and you see you have little ‘knobdules’ here, which is designed to take, what we call in the industry a PP3, or a nine volt battery. You can actually apply remote power to those nodules there, and that would allow you enough juice then to be able to punch your code in and get in. So that's absolutely first class. That's brilliance news. So therefore, then, you have that degree of redundancy. Of course, also, you can get the cylinder that we're sit in here as well. This cylinder will also allow you then to be able to mechanically override it. Should anything happen to the locking solution, then this particular cylinder does allow you the old fashioned way of putting the key in and operating the lock in the event that you can't get in. So another major plus when it comes to that as well. Now, as standard, we've put a few key points in here. It's standard with two user codes, as you can see here. We supply two fobs just as standard, as part of the kit. You can have up to a maximum... There's an alarm system on this particular one as well. Once it's actually locked, if it sees any form of brute attack, then it will sound an alarm system on the actual unit itself to alert occupants around, and inside the house, that somebody may be tampering. As we mentioned there, we've got the battery and a key override, and on the page as well you can download the PDF document that explains also all of the other key features, and how the program... Etcetera. So absolutely fantastic in respects to that. On the backend here, if I was to lift this up here like that, in here you would be able to see the batteries and so forth, and all of the programming parameters, etcetera, that will be in the back here as well to allow you to program the whole unit up. So I'm gonna take my hat off to Yale. There's been a long time in development on this particular product, but I've gotta say that they've actually thought about it. They've designed, in my view, at least, that there's a substantial product here for securing your house, and therefore then allowing you to use either a fob in which to open the door, or a keypad in which to open the door. Now, when it comes to fitting one of these, and this is probably where people would start scratching their head a little bit, you've got to bear in mind the thickness of your particular door. So, in plain English, most wooden doors in the U.K. are 44 millimeters thick. Some UPVC doors can be up to around about 60 millimeters thick, and sometimes the position of the actual lock in the actual door may not necessarily be in the center. So that's the reason why we have the whiteboard here today. So I can try and draw and explain to you what you need to be considering when you're measuring this up. So if you've got yourself a UPVC door, so if you can imagine that's the inside here, and then that's the outside here... I will just call that in and out, okay? So the lock would actually sit on... This is the actual leading profile. This particular lock here, the actual multipoint lock, and if you can just quickly have a look at that there, that multipoint lock unit there may not necessarily be sitting in the center, okay?It may actually be sitting off center. It may actually be situated here. So, for an example, therefore the actual measurement from here to the center, and then from there to the inside, or to the outside, in this particular case, may actually be different. 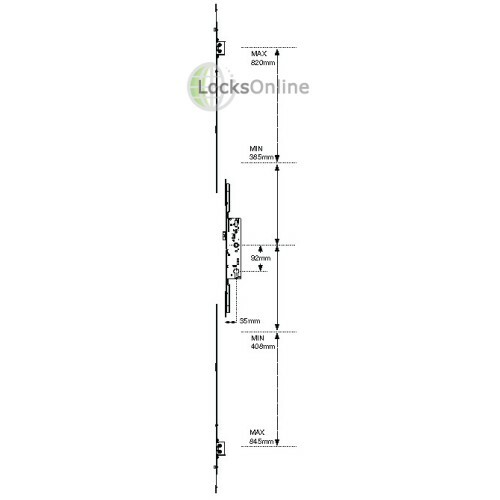 So what we've tried to do on our web page there, underneath the actual lock, etcetera, we have created a list of different thickness doors, and therefore then there is a standard list of where this lock will sit. So in your particular door, you would need to measure the overall length of the door... Or, sorry, the overall width of the door. Forgive me. Then you need to measure then from the inside to the center, and from the outside to the center. As long as you then look down through the list there, it will tell you then what fixing kit that you'll need, and you can make the choice, what finished cylinder do you want? Do you want it bras or chrome? I think these are available in chrome or brass, and then it will also then, as well, give you the size of the cylinder that's needed as well, in which to work with your particular type of setup. So just very, very quickly, get your measurement from the inside to the center of the lock, or from the outside to the center of the lock, and that measurement there... And obviously the overall measurement, and that will then give you an indication as to what fixing kit you will then need in which to fit this on your door. So that's basically the reason for the board there. I hope that I've explained that to you. But if you need a bit more info on that, pop us over an email, and I can by all means chat with you on the phone if you're not exactly getting through to that. OF course, a wooden door, for an example very, very quickly, a wooden door, the typical wooden door, the lock would be situated in the center, and if that's 44 and that there then to the center is 22, and therefore then from there to there is 22, then that's how easy that is. But if that was over here by 10 millimeters, then this would then be 12 millimeters, and that would then be 32 millimeters. So that's what you're trying to measure in respect to a UPVC door as well. So that gives you some sort of idea in regards to how the actual lock is gonna be situated in your door, and then we can supply you the right fixing kit to make sure that the job gets done first time. Now what I wanted to mention to you, and I think it's quite important as well, is that, if I actually position this on the back here, you'll be able to see... I don't know if you could just zoom in across this particular section here... You can see that there's a fixing point here, there's a fixing point here, and then there's a fixing point there that will bolt through the actual Doormaster locking solution there. There's also another fixing point here, okay, which is actually locking through the system there. You have to forgive me. I'm pressing buttons on it. Then there's a final fixing point at the bottom here. So what Yale have done is they have managed to put a fixing point there, there, there, there and there. So they've made it extremely robust in regards to how it's gonna be mounted onto the door. So that's an absolutely brilliant system. But, of course, if you're using somebody else's multipoint lock, this particular fixing here, and this particular fixing here, may not be able to work in conjunction with the lock that you may have. So you may only end up relying on the fixing here, the fixing there, and of course the fixing at the bottom. So it's well worth you having a look at your particular setup. Now what I'm gonna do is I'm gonna use the center of the handle here as your data. So if you were to measure your handle, and then you were to measure down the lock, because the actual keyhole is down at the bottom here... If I was to measure to the first fixing center there, I'm looking at roughly the center to center of around about 23 millimeters. Then, if I was to look at that fixing center there to the bottom one there, you're looking there at about 140 millimeters. If I was now to look at doing it the opposite way there, if I can just get that on there like that, from that center spindle fixing center upwards now, you're looking at something in the region of 75 millimeters to the first one, and then, from the fixing center to the second one there, we're looking at roughly around about 130 millimeters, and then finally then to the top one there, you're looking at about around 175 millimeters there. I don't know if you can actually get that in there. So what I wanted to try and to explain to you is that, if you're thinking of using somebody else's center gear box and locking system, or you're not planning on wanting to get rid of the actual locking solution, but you want to be able to use the KeyFree, just be mindful of those measuring centers, and therefore then it will allow you to know whether or not you'll get at least 50%, 60% or 70% of the fixing centers in which to fix this actual lock to the door. So here you go, guys. There's loads more that I could be talking about. The information is on our website. By all means, spend five minutes there, and have a read through all the manuals. I've gotta say, I think Yale have come up with trumps on this particular product. I've been impressed. I've been playing around with it now for a couple of days, and trying to understand how it all works. 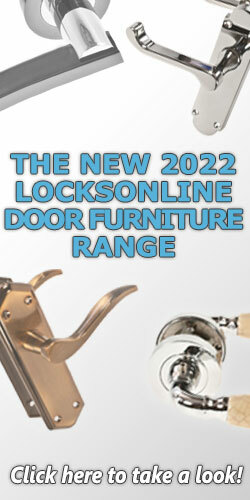 They've managed to, in my view, at least, make sure that they've covered quite a few of the key points that has always been an issue, has always been a concern when it comes to trying to put combination locks on UPVC or multipoint doors, and being able to get all of this to actually work as standard. So, to recap, on ours you'll get the actual lock. We can then give you the options as to what fixing kit you'll need. 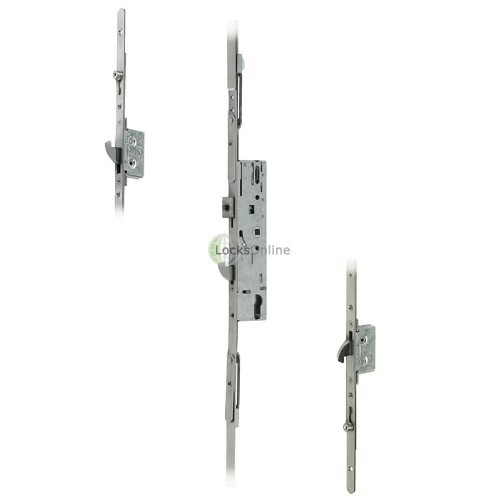 You can then buy the type of door mastering with all the different back sets, if you want, and our kit comes standard, then, with two fobs as well to allow you to remotely open the door. So there you go, guys. I'm hoping that I haven't bored you too much, and trying to explain to you how this actually works, and hopefully give you a little more detail. But, listen, if you need a bit more advice, or you want some more information, pop us over an email. Use the live chat that we have on our website. You can either talk to me or any of the guys. Totally no problem there. You speak to me or any of the sales team. Either way, we don't mind. Or, by all means, do it the old fashioned way. Pick up the phone and give us a cool. Either way, we'd love to hear from you. More importantly, I hope to see you as one of our customers. So for me, Daryl, and all of us at the team, thanks for taking the time to tune in. I hope speak with you real soon. Take care now. Bye-bye. Keyfree is the new generation of family-friendly security. It's the digital door lock, only from Yale. 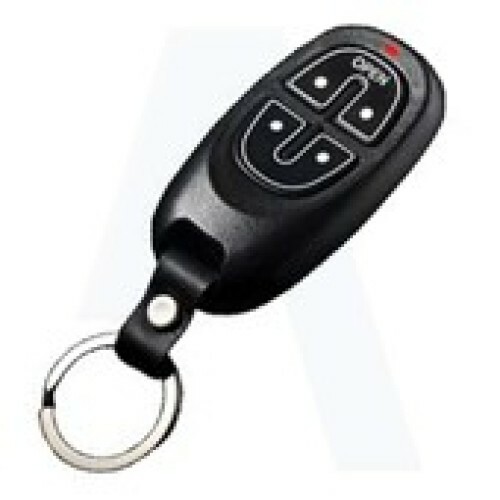 Unlock your door with the remote key fob, just like unlocking your car. It transmits a unique signal, so only your key fob will work with your door. Use the keypad to unlock your door with a 4 to 12-digit code. The keypad lights up, so the numbers are easy to see at night. It's simple to change your code, and you can set a visitor code, so you don't need to give out your number. You can also mask your code, by entering any series of digits, starting or ending with your number. The 9-Volt battery backup provides a fail-safe and there's a mechanical override key for emergencies. Keyfree is so easy to use. It's designed for your home. It even talks to you. And if you don't want to chat, you can turn the voice prompts off. Keyfree has been tested to meet secured by design standards, the police-approved home security scheme. And it features a built-in 80 decibel alarm. Yale Keyfree has undergone rigorous weatherproof testing and it's tested to over 200,000 cycles, so it will stay looking good and performing well for years to come. 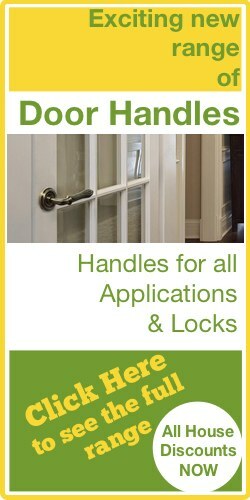 Keyfree makes your new door complete.